The Agilis IF / L Band Converter series provides a wideband cost effective IF to L and L to IF Converter. This Agilis converter is ideally suited to teleports and earth stations where existing IF (70-140MHz) equipment is required to run on an L Band (950-1750MHz) uplink chain to the BUC or vice versa. The Agilis IF / L Band Converter series provides a wideband cost effective IF to L and L to IF Converter. This Agilis converter is ideally suited to teleports and earth stations where existing IF (70-140MHz) equipment is required to run on an L Band uplink chain to the BUC or vice versa. The Agilis IF / L Band Converter series utilises independent synthesizers for both the transmit and receive chains providing superior performance when compared with other design. These converters can be configured using an intuitive menu tree from a LCD front panel. They are also equipped with optional L Band auxiliary ports both on the transmit and receive chains for integrated working with other L Band systems. 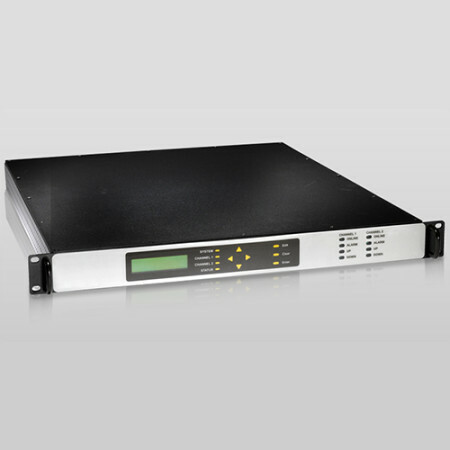 Additionally, Agilis Converters can also be configured and monitored remotely on a PC using an RS232/RS422 interface. They provide 24VDC, a very stable and low phase noise reference of 10 MHz for the BUC and a 15 VDC and the reference for the LNB. The BUC and LNB can be driven with cables up to 60m in length. These converters come in a standard 19” Rack of 1 RU height.